This 5.5 mile loop is the second most popular hike in the park. 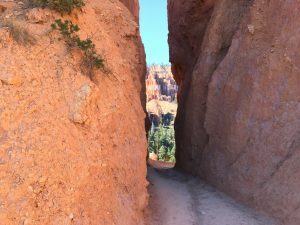 It’s not for non-stop views around every corner as you play “peek a boo” with many of Bryce’s finest specimen of hoodoos. 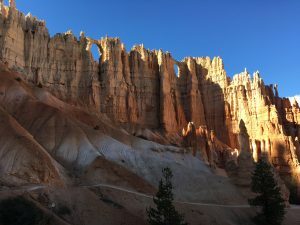 If you’re looking for the perfect combination of hoodoos and rock tunnel paths, this is a can’t-miss hiking destination. We did this loop counter-clockwise and didn’t regret it. The loop is only part of the trail; it’s more of a lasso. And the steepest part of the trail feels like the initial out-and-back before getting to the loop. 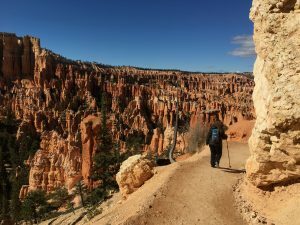 As with all the loop hikes in Bryce, if you get tired, take the opportunity to look around. The same geological feature can look quite different from either side. This trailhead is, arguably, the most troublesome for finding parking. It’s a single, moderately sized parking lot. And while it’s nowhere near the full 16-mile drive out to Riggs Point, it’s some distance into the park. The good news is that the shuttle does reliably run to Peek a Boo Loop trailhead. If you’re going into the park on multiple days, a reasonable plan would be to drive into the park one day and use the shuttle on another day to access Peek a Boo Loop.